A more robust leave in conditioner for your beard made from natural ingredients that are good for your hair and skin. (4 oz). Our EXSULTET beard balm is scented with Frankincense, Patchouli, Myrrh, Balsam, and Lavender essential oils. 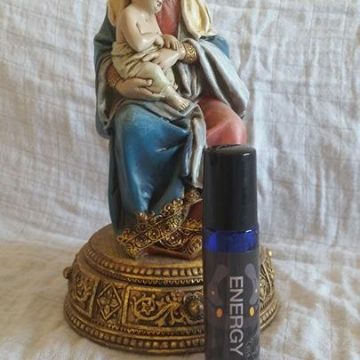 A rich, heady scent reminiscent of the sacred chrism used at baptisms. A more robust leave in conditioner for your beard made from natural ingredients that are good for your hair and skin. (4 oz). Beard balm is best applied after a shower when your beard is towel-dried, but still damp. Scrape about a nickel sized dollop out of the jar with your thumb and place in the palm of your hand (less for short beards, more for long beards). Rub it around in your palms until it is melted, and then apply thoroughly to your beard. Make sure you get all the way through to your skin. Work the balm through your beard (don’t forget the ‘stache). 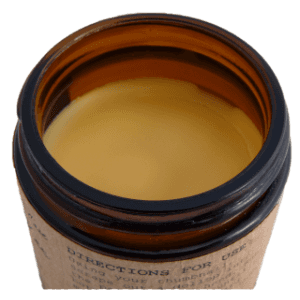 When the balm is thoroughly applied, comb your beard to neaten it out and evenly distribute the oils. Some men like to also use a boar’s hair brush for this purpose. BEESWAX: Bees make it, so it’s a natural product. 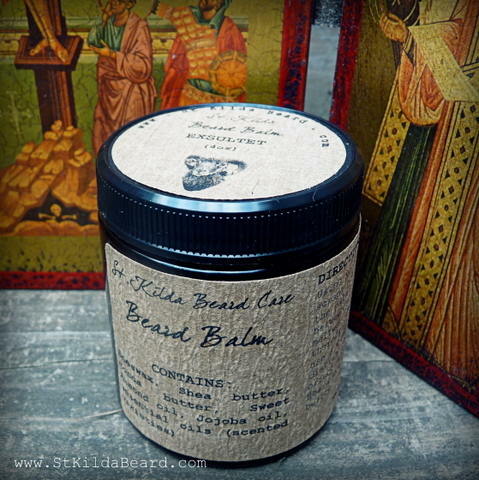 It has a nice feel, a light, pleasant smell, and is rich in Vitamin A. It’s what gives beard balm its hold. 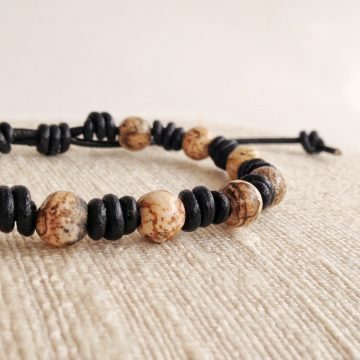 SHEA BUTTER: Another natural product that comes from the nuts of the African Karite tree. It’s full of Vitamins A, E and F as well as antioxidents, so it’s great for your skin. It’s often used on its own as an anti-irritant. COCOA BUTTER: This comes from Cocoa beans and is also used in making chocolates! 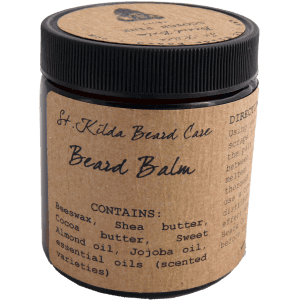 It, along with the Shea butter, is what gives beard balm its spreading texture and allows it to be absorbed by your beard hair. SWEET ALMOND OIL: A cold pressed oil made from almonds. It softens and conditions your hair, and is really good for your skin (it’s commonly used in therapeutic massage). It helps prevent itchy, dry skin beneath your beard. It also helps prevent ingrown hairs. ESSENTIAL OILS: Our EXSULTET beard balm is scented with Frankincense, Patchouli, Myrrh, Balsam, and Lavender essential oils. 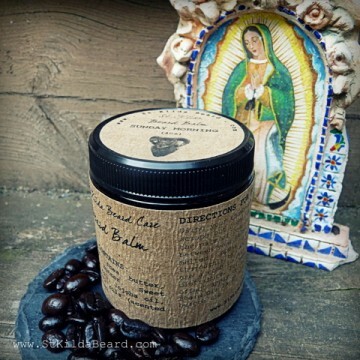 A rich, heady scent reminiscent of the sacred chrism used at baptisms. In other words, it’s all natural stuff that you want to put on your face. I am a husband and father of six children ages one through fourteen. I serve as the Catholic Campus Minister at Western Carolina University in the mountains of NC. My wife is our parish DRE and a full-time homeschooling mother. She is a cradle Catholic, while I converted at the age of 23. Currently I am a candidate in formation for the permanent diaconate for the Diocese of Charlotte. We are a very crafty, DIY kind of family. My wife enjoys the fiber arts (spinning, knitting, crocheting). I enjoy making traditional hand sewn-Scottish kilts. We both have other hobbies and crafts we enjoy. I also have a pretty magnificent beard, which needs some beard-TLC. This, combined with our DIY-attitude was how St. Kilda Beard Care was born. We use only all-natural ingredients in our products, chosen to promote healthy skin and hair. We scent them with only 100% therapeutic grade essential oils — no artificial fragrance oils are used in any of our products. I make the beard oils and balms. My wife makes the soaps and shampoos, by old-world hand crafted methods. We also raise a rare breed of primitive domestic sheep called Soay, which come from the St. Kilda islands off the northwest coast of Scotland. Their homeland is where the name “St. 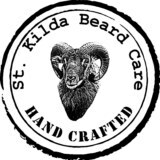 Kilda Beard Care” is derived from, and our own ram’s picture graces our logo. All items are shipped via USPS. 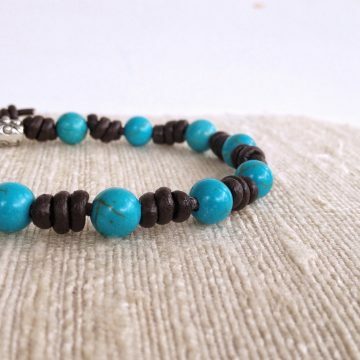 In most cases items will be shipped within 1 to 2 business days of your purchase. Once opened, cosmetic and health care items cannot be returned. If any item arrives broken, damaged, or not as ordered, please contact us within 5 business days for a replacement.